Featuring professional investor David Campbell and veteran financing strategist Graham Parham. If you are a real estate investor, you are trying to control more assets and reduce your liabilities. A savvy real estate investor knows that good debt can work for you; investor financing can be an asset rather than a liability. If you would like to learn how to create good debt and use that debt as a powerful wealth creation tool, this FREE webinar is for you! 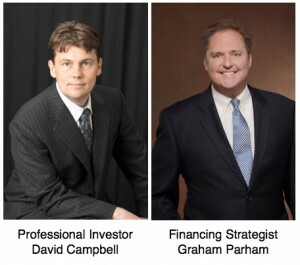 Professional real estate investor David Campbell and world-class financing strategist Graham Parham will teach you how to use creative and conventional investor financing to increase your cashflow and real estate investor profits. If you can borrow money at a fixed interest rate of 4% and invest conservatively at 6% profit or better, how much money would you like to borrow? Let’s see… I can borrow $100 and invest it to make a $6 dollar profit. After I pay $4 of interest there is $2 of profit left over for me to keep… Making money on the bank’s money is called arbitrage and it’s the way people get rich in real estate. It is almost impossible to create a fortune in real estate without the responsible use of leverage (debt). If you could buy property with 100% financing and produce positive cashflow, how many of those properties would you like to own? If you said “AS MANY AS I CAN GET!” you’ve got the right idea. As a real estate investor wouldn’t you like to realistically know how many you can get? If you know the rules lenders are working with, you can develop real estate investor strategies to use these rules to your advantage. If you don’t know the rules, you can’t play (at least not very well). In this sixty-minute free webinar, our panel of experts will help you unravel the mysteries of real estate investor financing. 1) How to prepare your balance sheet, credit score, mindset, and acquisition strategy to borrow money from banks at unbelievably low interest rates. 2) Creative real estate investor financing strategies to buy income property using low interest rate loans when you have cash but no credit and no income! 3) Creative real estate investor financing strategies to buy income property using low interest rate loans when you have a good job and good credit, but limited amounts of cash for the down payment! 4) How to create double digit, triple digit, or even infinite returns using arbitrage – e.g. borrow money at a fixed rate of 4% and invest it for virtually guaranteed profits of 6% or better. 5) How a real estate investor can leverage even small amounts of equity in their existing real estate to buy more income property. 6) how to refinance your primary residence and rental properties at today’s low interest rates, even if you have NO EQUITY? Used properly, investor financing (debt) can be a powerful wealth creation tool. Used incorrectly, it will wipe you out. This webinar could be a powerful next step in fast tracking your way to real estate investor riches while avoiding hidden pitfalls along the way. If you are or want to be a real estate investor, this is possibly the most important educational event you could attend. This event is too important to miss and too important not to share with your friends. Our faculty will help you understand the important logistics of getting a loan and we’ll show you the creative secret sauce to create wealth faster than you thought possible. You can download the presentation slides in pdf form by using this LINK to our SLIDESHARE channel.